The Integrated Editor is a text editor which is tightly coupled with the audio file of a transcript for easy cross-referencing. We use this tool internally for Proofreading and QC. Today we are releasing this tool for our customers as well. The editor can be launched from the Check & Download button on the Recordings page. The editor looks like the following once it loads. 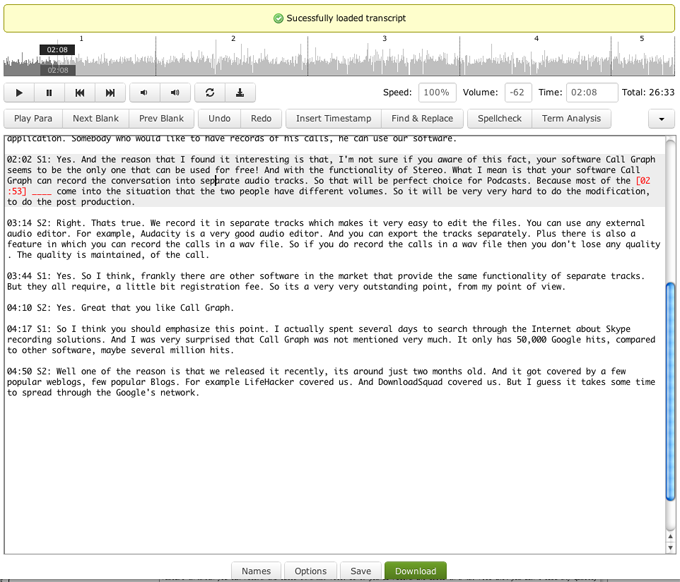 The Integrated Editor has some important features which makes it easy to check the transcript against the audio. It can position the cursor on the transcript as you skip forwards and backwards through the audio. The positioning is accurate to +/- 50 characters. Conversely, it can play the audio from a particular cursor position of the transcript. The audio position is accurate to +/- 10 seconds. This tight coupling makes it a breeze to jump through the audio and the transcript without having to manually control the audio player. The editor also supports keyboard shortcuts to faster editing. The keyboard shortcuts can be customized and you can assign a key combination to a particular action. There are more than 80 actions available to control various functions of both the audio player and text editor. Keyboard shortcuts is useful for heavy editing. Please note that some key combinations may or may not work depending upon your browser and Operating System (eg. Ctrl+N cannot be mapped on Windows since it’s pre-configured to open a new browser window). The keyboard shortcuts may not work if there are other programs configured to use those key combinations and are running (eg. ExpressScribe). Close any such programs or use a different key combination. Another useful feature is variable rate playback. It’s currently supported only for Google Chrome and let’s you speed up or slow down the audio during playback. Playing the audio at faster rate cuts down the time required to go through the entire file. You can maybe finish a 1 hour file in 30 minutes if you play it at 150% speed. Terms Analysis is another useful feature which highlights terms which may be out-of-context in the transcript. The highlighted terms can then be cross-checked with the audio. Here’s some tips on how to use this editor effectively. Click on the Next Blank button to cycle through the blanks. As the audio of the blank is played, the cursor will be placed on it and and it will be highlighted. You can then edit the blank and/or remove it. You go through all the blanks in the transcript quickly and fill them up. Click anywhere on the waveform to play that part of the audio. The cursor will be positioned +/- 50 characters of the audio timestamp. Use this feature to randomly check segments of the transcript. Press Shift+F10 to play the audio corresponding to the current cursor position. The audio position will be accurate to +/- 10 seconds. Enable time-coding if you have it disabled. It improves the accuracy of the cursor/audio positioning during jumps. Note that if you have it disabled and enable it after making some edits, then those edits will be discarded. Therefore, enable it a the start and disable it again once you’re done checking. Memorize the keyboard shortcuts for most frequently used actions. Play, pause and skip backwards are the most frequently used actions. The default shortcuts for those are F10, F11 and F7. Remember to rate the transcript before downloading. Your feedback is important to us and helps us improve our service. The Integrated Editor will vastly simplify the transcript checking process for you. You can quickly go through the transcript and verify it’s correctness before using it for your end purpose. Please contact support if you face any issues. We will be glad to help you out. Comments and feedback also are most welcome. This Integrated editor will be playing the audio and simultaneously writes the transcript ?or after the text (which has been written by the candidate) does it check ?